Over £26,000 raised for charities in 2018! We are delighted to announce we have raised a fantastic £26,120 for our chosen charities in 2018! The money was raised through a combination of in-store events and staff activities. We are thrilled to have raised this huge sum and thank all our customers and staff for their ongoing support. £15,315 for Mid and North East Essex Mind to support local people with mental health problems. 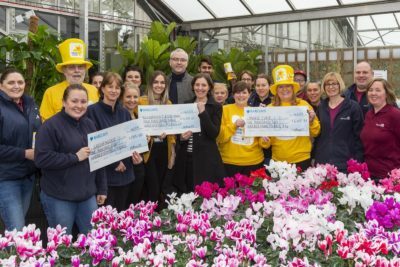 £5,210 for Marie Curie to help local families living with a terminal illness. £1,815 for Greenfingers Charity to create magical gardens for children in hospices. 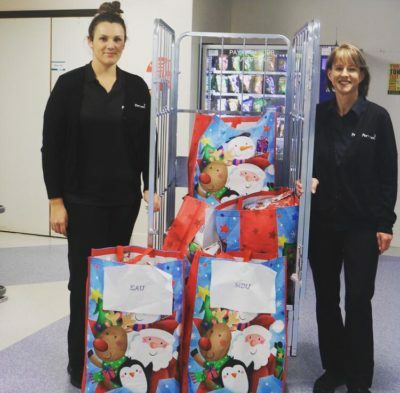 £3,780 for Colchester & Ipswich Hospitals Charity to donate fans to wards and Christmas presents to patients at Colchester General Hospital (money raised by the Coffee Shop & Restaurant team). 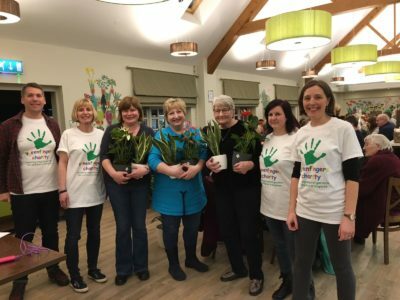 In March, over 120 customers and staff joined us for a quiz night in our Coffee Shop & Restaurant and the event raised over £1,600 for Greenfingers. In May, seven members of the Perrywood team – Holly, Sally, Kim, Selina, Catherine, Tanya and Arif – took on the ultimate challenge by completing a tandem parachute jump from 13,000 feet. Between them, they raised an incredible £4,200 and with the match-fund from Perrywood, a total of £8,400 was raised for Mid and North East Essex Mind. In June and July, Connor and Ryan took part in two cycle rides, Dragon Ride L’Etape Wales (223 km) and the Prudential Ride London-Surrey (100 miles). Together with the match-fund from Perrywood, the team of two raised over £1,200 for Mid and North East Essex Mind. 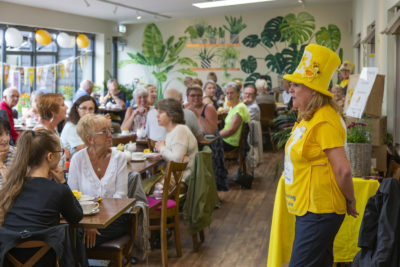 Our Marie Curie Blooming Great Tea Party held in the Coffee Shop & Restaurant in August was a ‘blooming great’ success! £1,498 was raised for Marie Curie. Over the summer months, the Coffee Shop & Restaurant team raised funds and delivered twenty-four fans (and homemade cakes!) 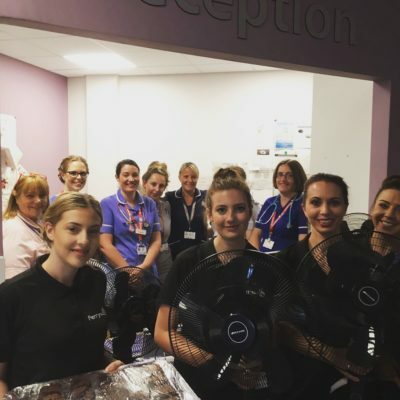 to four wards at Colchester General Hospital – these were gratefully received during the heatwave! 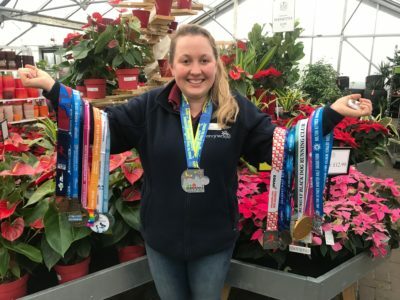 Zoe, from our Houseplants team ran an impressive eighteen half marathons in 2018! As a result, together with the match-fund from Perrywood, Zoe raised £2,391 for Mid and North East Essex Mind. Finally, in December, the Coffee Shop & Restaurant team raised £2,700 to purchase 350 Christmas presents which they delivered to wards on Friday 21st December. These are just some of the events in 2018 that contributed to the grand total of £26,120. In addition to this sum, Perrywood has also donated over £5,000 of plants, gardening equipment and gift vouchers to local schools and individuals. This includes sponsorship of the St Helena Hospice Gardening Group and the Growing Communities competition for schools. In 2018, we also sponsored the St Helena Hospice Forget Me Not campaign and the Tiptree Scouts Christmas card postal service. In 2019, we will be supporting Kids Inspire, Colchester & Ipswich Hospitals Charity and Greenfingers Charity. Our first fundraising event will be the Greenfingers charity quiz night on Thursday 21st March. Tickets for this event are now available to purchase at www.perrywood.co.uk/tickets.